Young Kolkata Knight Riders (KKR) pacer Prasidh Krishna in an interview, spoke about his 'ideal preparation' and also revealed that he is currently working on his consistency. 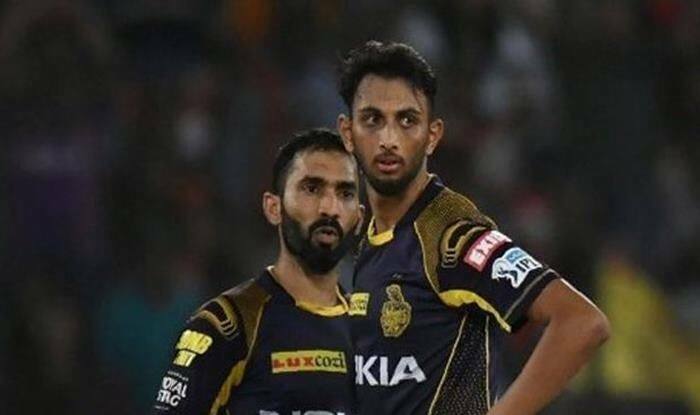 Young Kolkata Knight Riders (KKR) pacer Prasidh Krishna is looking to be consistent this season, an aspect he feels is the biggest attribute a bowler can add to his arsenal. He has also revealed that the ideal preparation for him is bowling against his colleague Andre Russel. The 23-year-old did not get too many games last year but has been in the scheme of things this season, playing in all the three matches so far. “Consistency is the best weapon. That’s one thing that I have worked on. Apart from that, I do work on the variations I bowl,” Krishna told reporters here. “I would want to get more speed, because that is something not everyone can do. I want to do it consistently,” the 23-year old local boy said. After going for 33 runs in his four overs, Krishna was picked by KKR captain Dinesh Karthik to bowl the decisive Super Over against Delhi Capitals on Sunday after KKR clawed back into the match from what looked like an impossible position. He restricted Delhi Capitals to 10 runs in the Super Over, taking the wicket of Shreyas Iyer in the process. However, Rabada gave away only seven runs while defending the score and took the wicket of the dangerous Andre Russell. Speaking about the faith shown in him to bowl the Super Over, Krishna said, “Initially I was very happy as the team trusted me to do the job. I thought the result depended on that one over so I was happy to take the responsibility. We ended up on the losing side but we still have a lot of positives to take. Bowling to Russell in the nets helps Krishna get a lot of confidence as he knows he is bowling to the best T20 batsman in the world, he said. Russell has been in terrific form so far this season, with scores of 49 n.o., 48 and 62 in his three innings, helping KKR win on two occasions. The 30-year-old West Indian has amassed 159 runs at a jaw-dropping strike rate of 248.43. “It is the ideal preparation as when you are bowling against him (Russell), it does a world of good to your confidence. When you go back to one of the matches, you know you have done so well with Russell,” Krishna said. KKR will take on a downbeat Royal Challengers Bangalore on Friday at the M. Chinnaswamy Stadium in Bangalore. Krishna was quizzed about getting an opportunity to bowl to Virat Kohli and AB de Villiers. “I am coming up against the best two in the world today. It is going to be a challenge and if I do well, it will help my confidence,” he said. Krishna, who turned out for Karnataka in the Syed Mushtaq Ali domestic T20 tournament, added that the meet helped him understand team values. On playing in front of his home crowd, Krishna said his parents will be watching from the stands and he is hoping to make them proud. KKR are placed fourth in the points table after three matches.